There is nothing so classic as the use of brick to warm up a space, add a sense of modernity and to enhance aesthetics inside homes and commercial buildings. Its use and visual appeal continues outdoors and amongst landscaping. Thin brick veneer has emerged as a great alternative to traditional brick, giving the impression of traditionally laid brick while being functional. This modern material features comparable benefits of the beauty of classic brick with a variety of available colors and textures. Additionally, its durable, cost effective, has lower weight constraints and easy to install. Because it is lightweight, at 15 pounds-per-square-foot, and its versatility, thin brick veneer is commonly used both inside and outside to create a pop of visual interest. Its benefits make it ideal as an accent for walls, to enhance a fireplace, or update an outdated kitchen island. Outside, thin brick can often be seen adorning chimneys or retaining walls, as part of a building’s foundation, or even as a visually pleasing element to a patio space or pool area. Selecting thin brick veneer allows for a classical look and feel associated with traditional brick while achieving modern functionality. In addition to the material itself, it’s also important to take into consideration the role of barriers in order to sustain beauty, longevity, and structural soundness. Thin brick veneer found its birth in the 1950s as a way to reface existing construction. However, it has evolved into a modern material that is used in both residential and commercial construction. Although thin brick is made using the same materials and processes as traditional brick, it weighs much less than traditional brick, and is considerably thinner, making the cost and complexity to install much lower. Thin brick veneer’s reach extends to providing superior benefits over other forms of cladding used in the construction of commercial and residential structures. Not only does thin brick provide noise reduction by reflecting sound waves and absorbing sound energy, but it also can lower the impact of damage, wear and tear, heat, vandalism, and more. Its thermal performance is increased when added to an existing wall. Because brickwork has a high thermal mass, it stores and releases heat slowly, which requires much less insulation than walls not using brick. Lastly, anchored brick veneer construction is separated from the existing wall by an air space that creates a drainage wall. This increases its moisture resistance, allowing for any wind-driven rain that penetrates the brickwork to drain down the back face to flashing and weeps. Thin brick veneer uses the thickness of the brick and mortar backing as a barrier wall to resist water penetration. The importance of choosing a barrier for thin brick veneer cannot be overstated because of its large area of exposure, as well as its ability to prevent weather-related damage, such as water infiltration. Having a proper barrier can eliminate the potential negative effects of freeze or thaw damage, thermal damage, and cracks or delamination in a structure or finishes. “When selecting an appropriate air and water barrier, determining factors should include a review of applicable building codes and standards, location and placement of the air and water barrier within the building envelope, substrate type, building envelope finish and method of adhesion,” said Arthur Mintie, senior technical services director for LATICRETE, a Connecticut-based family owned business that provides green flooring and facade materials. LATICRETE’s single component MVIS™ Air & Water Barrier membrane is one example of a proper and secure air and water barrier for thin brick installation, according to Mintie. This barrier is liquid applied and adheres directly to a wide variety of substrates that include concrete, cement, exterior glue plywood and sheathing panels. “MVIS Air & Water Barrier contains a low VOC, self-curing formula with antimicrobial technology, and is ideal for construction projects where air and water barriers are required to improve building efficiency and durability,” Mintie explains. One of the benefits of thin brick veneer is in its installation. Compared to traditional brick laying, installing thin brick takes about half the time and also is less complex. Traditional brick and thin brick veneer structures use similar construction materials, the main difference is in the type of structural support. Structures that use traditional brick are built as free-standing walls tied back to a supporting structure like concrete, concrete block, steel frame or sheathing. The brick then becomes part of the building’s structural support system. In comparison, installing thin brick does not require the same support, nor does it impose the same weight loads. Instead, thin brick veneer is installed to the exterior wall substrate. “The building itself is often constructed from steel or wood frames, followed by suitable sheathing panels, lath and mortar leveling bed,” said Mintie. There are four primary methods of installation, the two most common being thick set and thin set. Using the thick set method of installation requires a contractor to apply the thin brick with a bond coat of mortar onto a mortar scratch coat. This method requires a reinforcing layer of either lath or mesh within the scratch coat in order to assist in controlling cracking due to shrinkage behind the thin brick. Alternatively, the thin set method of installation involves the thin brick being installed directly to the substrate by a thin layer of adhesive or modified mortar. When applying the thin layer of adhesive, it should be around 1/8 inch or 3.2 mm. Because of this method’s reduced thickness, it does not require a reinforcement layer. The recommended substrate for this type of installation is cement backer board for exterior adhered thin brick installed over stud walls. Installing thin brick using the modular panel systems approach involves the thin brick veneer being adhered or mechanically secured directly to a modular panel. This panel typically consists of metal, rigid foam insulation, wood, or other materials that are fastened to the substrate wall. Modular panel systems routinely have integral water resisting elements such as drainage mats or spaces. Compared with thick set and thin set installation methods, this method features grooves, tabs, or rails to align the thin brick courses, and to provide support while the mortar or adhesive cures. The final option for installation, prefabricated panels, allows for thin brick to be integrated into tilt-up and architectural precast concrete panels. These prefabricated panels are constructed by laying thin brick facedown into a form liner typically made of rubber or plastic. A concrete or fluid grout is poured over the back of the thin brick. Finally, to prevent staining a retarder or wax can be applied to the exposed face of the thin brick. Once it is cured, the panel is removed from the form liner to reveal the thin brick surface. The exposed concrete between the brick serves as the mortar joint. Alternatively, joints between the brick may be finished by filling with mortar or modified mortar and tooling to a desired profile. When selecting a mortar for installing thin brick, industry installation methods and standards require various product performance levels that match products to the application based on specification demands, local codes and complexity. 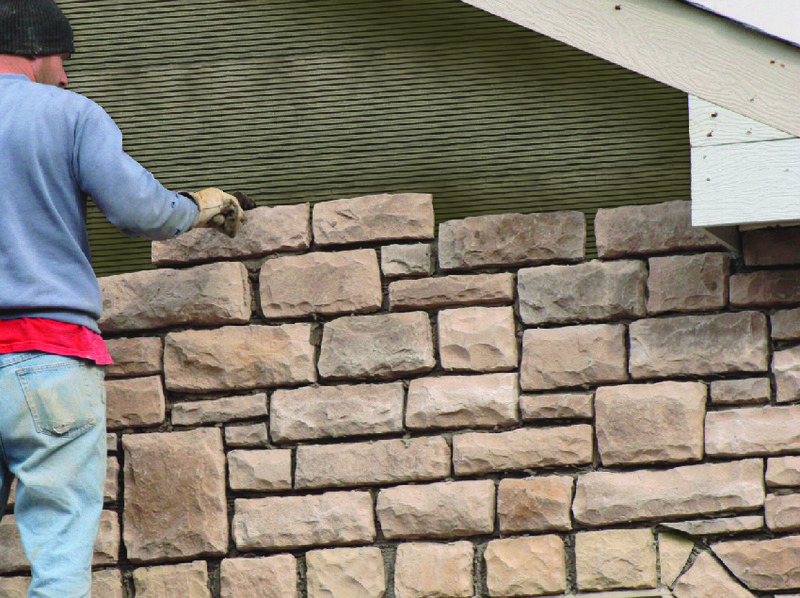 Whether applied over concrete or masonry substrates, installing mortar usually includes metal lath and often provides inadequate protection from weather. This can result in water intrusion as well as delamination of the thin brick. Using modified mortar typically consists of a portland cement mortar modified with a polymer or latex additive or a bond enhancer. The addition of latex may contribute to better adhesion, reduce water absorption, and provide greater bond strength and resistance to shock and impacts. When using the liquid form of latex, it is added as part or all of the replacement for water used when mixing mortar. “Usually the more demanding the application, such as areas heavily exposed to the outdoors, require the best adhesive mortars, grouts and installation accessories,” said Mintie. Applying thin brick under these conditions require the installation products to have superior working properties and ultimately better performance properties and characteristics, such as higher bond strengths, flexibility, and weather resistance. Once a suitable masonry substrate is in place and leveled to the specific plane necessary to receive the adhered veneer, contractors will then apply an air and water barrier. The thin brick adhesive mortar is then used to install the thin brick, with the mortar achieving the desired consistency before being applied to the substrate. The adhesive mortar is typically applied using using a flat trowel, making sure the adhesive forms good contact with the substrate. Additional adhesive mortar is applied with a notched trowel – 1/4″ x 3/8″ or 6 x 9 mm square notch – for an even bed of adhesive to the substrate. When the adhesive mortar begins to cure but still remains wet and tacky, more adhesive mortar may be applied to the backs of the thin bricks with a flat trowel. The mortar-covered back of the thin brick is then adhered to substrate, making sure to remove any excess. “Once the thin bricks set firm, use a high-performance pointing mortar, such as the MVIS Premium Pointing Mortar, to point the joints,” advised Mintie. While enhancing a home or an office, both inside and outside, with thin brick veneer provides obvious visual and aesthetic benefits, they extend much deeper. Nothing is quite so important as maintaining the safety and comfort of a project while ensuring the peace of mind that it won’t have to be redone in a few years because of damage, impacts, or other hazards. For a modern approach to a classic practice, considering thin brick sustains structural integrity while ensuring durability and longevity for years to come.